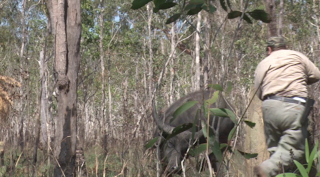 Whilst Spear hunting with Tim Wells from Relentless Pursuit in Australia earlier this year, Lynn was charged at 6ft by a Bull Buffalo! Only his quick reflexes and sharp shooting saved him from serious injury or even death! 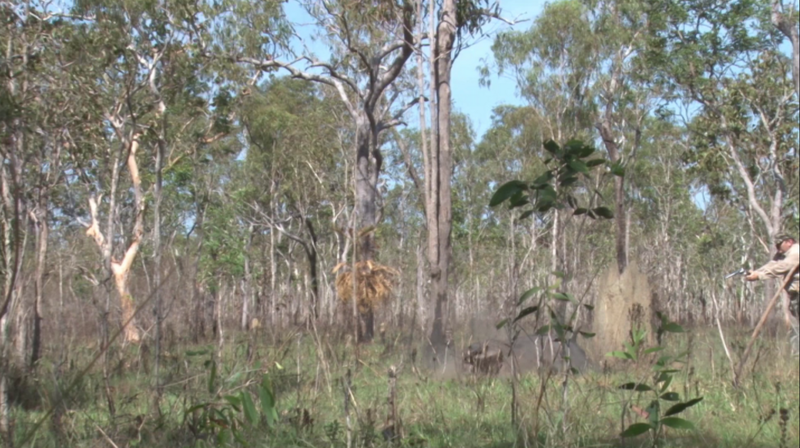 More exciting footage from this hunt will be airing on Relentless Pursuit in the New Year. 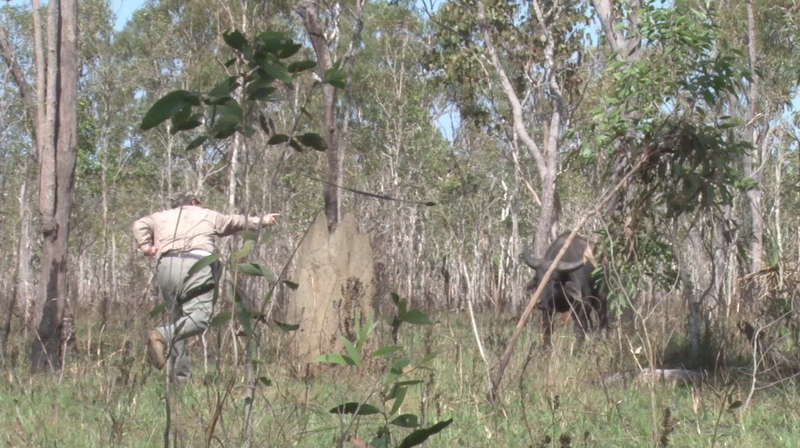 2) Lynn's spear is already in flight when the Buffalo turns and charges! 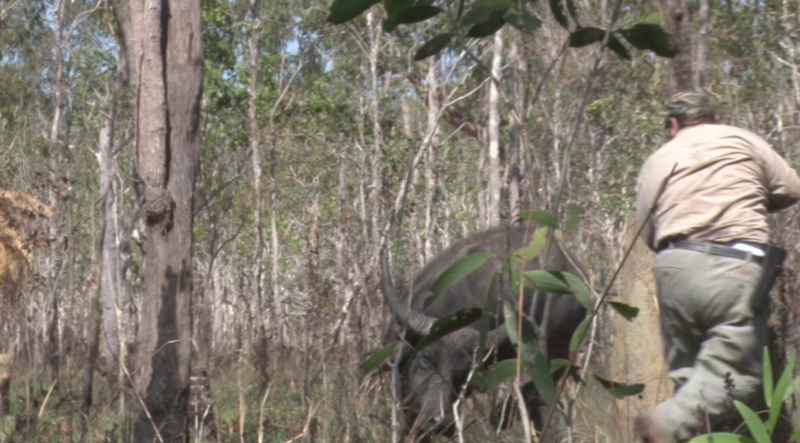 3) The Buffalo flicks his head up and catches the spear on his horn! 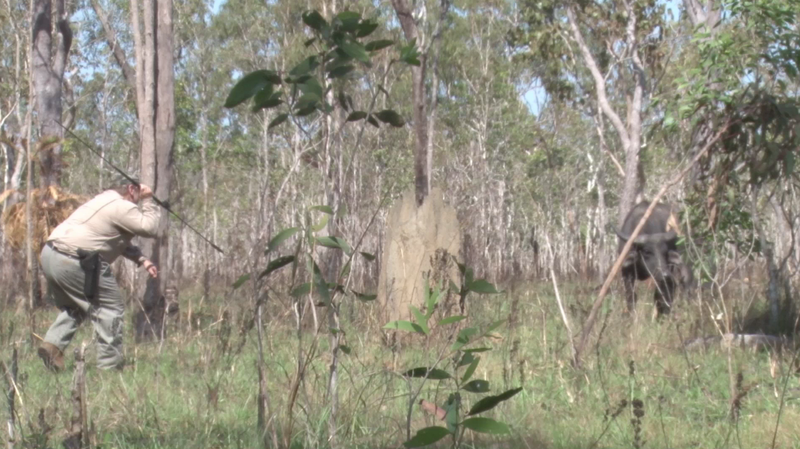 5) Lynn continues to draw his revolver and move around the termite mound. At this point the Buffalo is inches away from him! 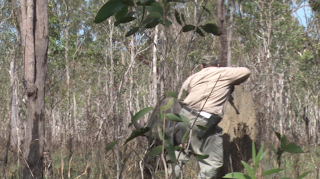 6) Lynn continues to angle away from the Buffalo, gaining ground as he draws and shoots his revolver double action. His first shot hits the Buffalo in the spine and drops him at Lynn's feet! 7) Lynn continues to fire his Super Redhawk. 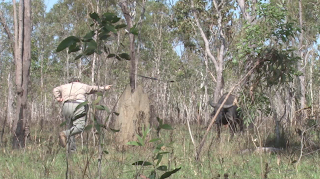 From the spear throw to the fatal shot on the Buffalo, the entire experience takes a mere 2.5 seconds! LYNN!!! How did that happen!! Wow! I am speechless. All your hard work and mental/ physical preperation has saved your life here! just increadible. One of the most impressive things I've ever seen. WOW! Litterally adranoline pumping through me right now. Just another reason you're the best. Lynn! You would have taken that Bull with your spear, Great throw! That was some fast footwork, it looks like your first shot put him down from FOUR FEET AWAY!!! Pretty cool. The Bulls reflex's are 2nd to none. Great kill hope he taste as good as he looks. I guess if your going to hunt with a spear it's good to have an obsticle between you and the buffalo, like the termite mound. It gave you just enough time to dodge the buffalo and draw your gun. With out the mound there I believe the Buffalo would have gored you. "I just.....let him have it"
Sir, All of your preparedeness came together in the few moments that you needed it. "10,000 shall fall to right and 10,000 shall fall to left, but none shall come nigh unto thee'. His Presence was in you. God Bless you for all you do supplying us with the practical tools for life and sport...and for the good sense to buy, pack and knowing how to use your Ruger. That's how real men hunt. Damn!!!! You are the man, Mr. Lynn Thompson, you are the man. Now this is TRUE hunting. Hats off to you bud. well played Sir, very well played! I second one of the above posts. The Lord was with you not only that day but all the days previous. Every moment before, every bit of blood and sweat and toil training he was with you. Your training allowed you to stand firm and survive. Normally one isn't privileged to see the preparation that goes into the moment of a miracle, but in your case we are given a rare look into the workings of the Lord. Your track record stands on its own because its built on the Rock. You provide the tools and knowledge to preserve life and liberty at a price ANYONE can afford. Keep up the great work. Way to go Lynn. That was awesome. Cold steel=nerves of steel. beautiful Hunt! Good Job Lynn, my only thought here is maybe a spare spear perhaps? just kidding. Thank God for the more appropriate weapon. I am a little disappointed and impressed at the same time. I was expecting you to drop him with the spear yet I was impressed with the speed, aim and force of such a primative weapon, you wer able to penetratate the horn. Good eye Lynn Thompson. when are you coming to Las Vegas? I would like for you to sign my knife. Matter of fact there is a trap shoot coming up in September sponsored by the Union Sportsmen Alliance. I would be honored if you could make an appearance. WOW! Adrenalin in action. Would have been nice to see this Bull taken with the spear. Here in Nevada when hunting Lion, Bear, Elk, & such with spear, bow, knife, etc. one is forbidden by law to carry a firearm and such happy endings are uncommon.